For four seasons now (five if you count the Richard Armitage season that aired in the U.S. under the title Strike Back: Origins), Cinemax's Strike Back has been one of the best action series ever seen in the medium of television. That is to say, it was a pure action TV show: its interests were based solely in delivering extended kinetic sequences of mayhem, where its two protagonists, Damien Scott (Sullivan Stapleton) and Michael Stonebridge (Philip Winchester), managed to find a way to survive against incredible (and sometimes even absurd) odds. It was, at its heart, a show convinced of the joys of making things go boom, but it also went about that fiery task with plenty of heart. The finale aired earlier this year in the U.K., so that might have had an effect on why the episode wasn't greeted with more fanfare when it aired on Cinemax. But it did little to dilute the overall effect of just how strong a finale the episode was. Michael J. Bassett has shepherded Strike Back through many storylines, and even stated he had an idea of what, when the time came, the final episode would be like. As it turns out, Basset, Stapleton, and Winchester found a way to distill the series down to its essence, to focus solely on its two main characters (partly because everyone else was dead or had left Section 20 – but mostly they were all dead), and to deliver an experience that, amidst all the gunfire, explosions, and fake-outs, was a surprisingly personal episode. The narrative of season 4 was a mixed offering, as off screen events (an injury) forced Stapleton's narrative into a relatively tamer situation with his onscreen son, Finn (Christian Antidormi of Spartacus). Although the temporary separation of Scott and Stonebridge had some negative effects on the fluidness of the season's overall storyline, and it sometimes felt as though characters made decisions simply because the story needed them to – Locke's (Robson Green) chasing of personal demons and Martinez' (Milauna Jackson) inadvertent inability to prevent the capture and eventual death of Richmond (Michelle Lukes) sometimes felt too prescribed – the season maintained a strong sense of purpose. Much of that has to do with the wise choice of casting Michelle Yeoh as the season's antagonist, Li-Na, who, when joined by Kwon (Will Yun Lee) came as close to detonating a nuclear device as any of the other bomb-loving villains this series has seen before. Thanks largely to the narrative thrust granted the season by Li-Na – which led to an absolutely fantastic and gorgeously composed episode that involved infiltrating North Korea and destroying a nuclear facility – season 4 managed to stay on track. So, when the penultimate episode ended with Li-Na being executed in custody, and Scott, Stonebridge, and Locke betrayed by the government official overseeing Section 20, it set up a finale that was free from the season's overarching plot. The effect of this, then, created a tense story of survival for the series' primary characters, one that, despite a stop off at an Austrian man's farmhouse, was surprisingly fast paced and, oddly, intimate. While Scott and Stonebridge did their best Butch Cassidy and the Sundance Kid, making a series of last stands against overwhelming odds – that at one point required a leap of faith into a river below – they were pursued by what ostensibly was the bizarro version of themselves – a Nega Scott and Nega Stonebridge if you will. Although they didn't factor into the story as much as they perhaps could have, the finale made terrific use of Faber (Duncan Clare) and Mason (Leo Gregory), two mercenaries that essentially represent what the show's protagonists might have been if they had made different choices. What Basset helped design, then, was a finale that explored Scott and Stonebridge's relationship – the fight in the forest was the Strike Back version of a married couple squabbling – while also looking to explore how these two consummate soldiers think of themselves. The two splash around in a bit of a moral gray area after Scott is injured, questioning how it became so easy and almost routine for them to kill in the line of duty. Scott wondering how it came to this point is a nice continuation of Stonebridge's discussion with Oskar (Wolf Kahler) about the life of a soldier and all that he's (perhaps willingly) sacrificed in order to live as he does. So, by the time the two make what appears to be a legitimate last stand against Faber and Mason (and the endless stream of men following them), the show aims to make a distinction between what it is to be a killer and what it is to be a soldier. The price tag Faber puts on the two men's lives is made under the assumption they are as unscrupulous as he is. It's a nice moment that frames Scott and Stonebridge in an unambiguous way that also feels about as close to a revelation hidden in plain sight as the series is likely to offer. The surprise, then, comes as Stonebridge perhaps proves it false when he unceremoniously guns the mercenary down. If you were to look back at the many scrapes Section 20's finest have managed to survive throughout these past four seasons, it would have been logical for them to go down in a blaze of glory – again, Butch and Sundance-style in that barn. The series had mentioned time and time again, it was their abilities as soldiers that often won the day against insurmountable odds, so, for the two to finally hit a brick wall in making an enemy of the alternate universe version of themselves, might have been fitting. 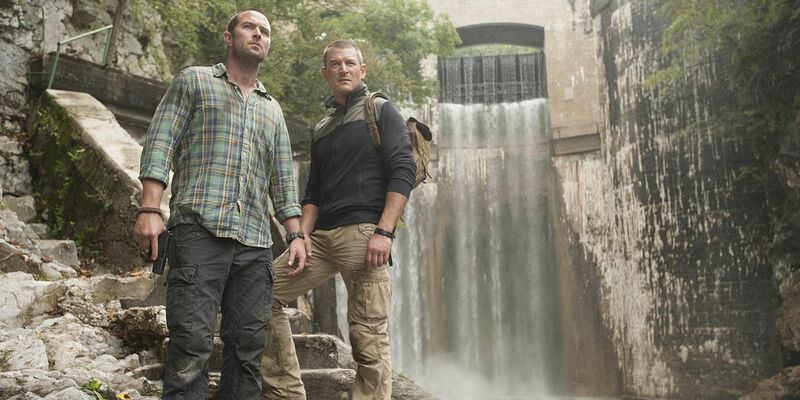 At the same time, though, it feels truer to what Strike Back is for the final moments to be Scott and Stonebridge (and Finn) fist bumping, smiling, and riding their motorcycles to Vegas. There is a level of cynicism in thinking the last three members of Section 20 were nearly executed by the government they were serving, and while it would have made for one hell of a talking point, it may have been counter to how the show views its characters and their mission. Giving Stonebridge his Clear and Present Danger moment with Ridley was enough, and ending things on a positive note felt like the right choice. Besides, it leaves the door open for more adventures of Scott and Stonebridge, now that we live in a world where no show ever truly ends. All seasons of Strike Back are available in the U.S. on MaxGo.